Technically, it's the hardest three consecutive holes on the PGA Tour. Unofficially, it's called the "Bear Trap". 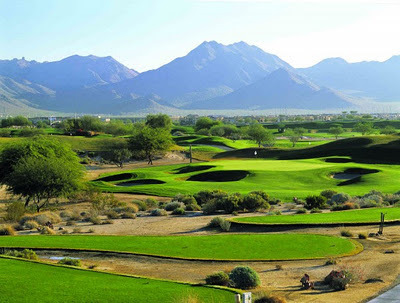 This week, Michael Thompson and the rest of the PGA Tour professionals will get to face holes 15, 16 and 17 at the PGA National Champion Course and those that survive will be in contention at the end of the week at the Honda Classic. The Bear Trap gets it's name from it's core architect Jack Nicklaus ("The Golden Bear") and averaged more than 1.17 shots over par last year. In it's entirety, the par 70 PGA National Champion Course was the second hardest on Tour. If the wind picks up, look for big numbers to be posted at the 190 yard par three hole #17. The hole features a very small, 30 foot landing zone that is nestled between a bunker on the left and a water hazard on the right. The wind blows primarily from the left to right making the water a distinct location for tee shots. Last year there were only 28 birdies compared to 236 pars, 100 bogeys, 63 double bogeys and 10 others. Michael will be paired with Kevin Stadler and Rod Pampling for the first two rounds. The trio tees off at 1:10pm ET from the tenth hole. "Solid week in Riviera Maya. I finally broke par on this difficult golf course! 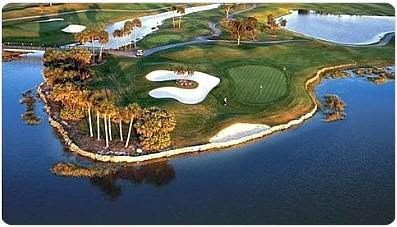 Tomorrow off to Palm Beach for the Honda Classic!" He ended up tied for 46th, which was worth a little bit under $11,000. He moves to #49 on both the money list and FedEx Cup points list. The constant wind at El Cameleon continued to curb competitor's cards at the Mayacoba Classic. At the termination of round three, Michael tallied a total of two bogeys and one double bogey, but also had a tetrad of birdies for a total of even par for the day, leaving him tied for 55th. Round 4 will get going at 5:58am PST and Michael will be grouped with Stephen Gangluff. This episode of the Thompson Tide has been brought to you by the letters C, T, and G.
The Mayacoba Classic is the first regular season PGA event that Michael Thompson has played at three times. Unfortunately, the two previous times he played there he missed the cut. Coming into the 2012 Mayacoba Classic, he arrived with a full season of experience under his belt, and a boost of confidence having finished T-17th at the Northern Trust Open the week before. Whatever it was, he performed well under pressure today amongst the always tough, always windy conditions at El Camaleon. Getting behind early with two bogeys, he fought back to even par for the day with two birdies, then fell back again to +3 on the 13th hole. With the cut line hovering around an overall score of +2 and +3, I knew Michael was going to have to come up big in his last five holes if he wanted to make the cut. Boy did he ever. On the 15th hole he drained a huge birdie putt which you can see in the video below. He then followed that up with another birdie on 17 to secure his spot no matter where the cut line fell. In the end he made the cut with a stroke to spare, so he gets to play the weekend at the Mayacoba Classic for the first time. 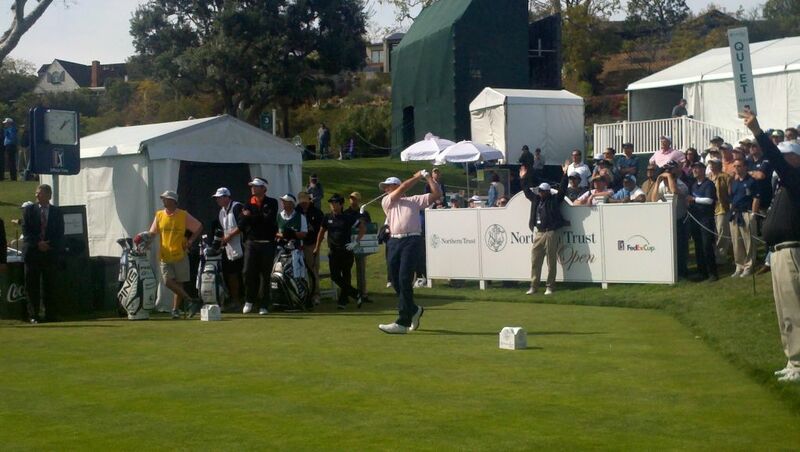 Michael tees off on Saturday at 6:10 PST and will be paired with PGA Tour veteran Fred Funk. Television coverage for the Mayakoba Classic will be exclusively on the Golf Channel. All times are Eastern Time. 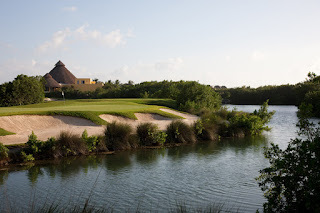 The Greg Norman designed course, El Camaleon showed it's claws on Thursday at the Mayacoba Classic just south of Cancun, Mexico. Scores ranged wildly from Will Claxton's -5 to +12. The holes strongly penalize wayward shots and the strong ocean breezes don't help either. Colorful scorecards were bountiful, and the goal was to keep your Camaleon scorecard blue instead of reddish-orange. As you can see from Michael's scorecard below, he had a pretty good round, fighting back from several bogeys and getting back to +1 which is on the happy side of the cut line at +2. He tees it up on Friday along with Vaughn Taylor and Nick Price at 9:10 PST. Lastly, a quick shout out to the other half of ThompsonTide, Roz, who's laid up recovering from surgery as he had a benign mass removed from his shoulder this morning. Heal fast! 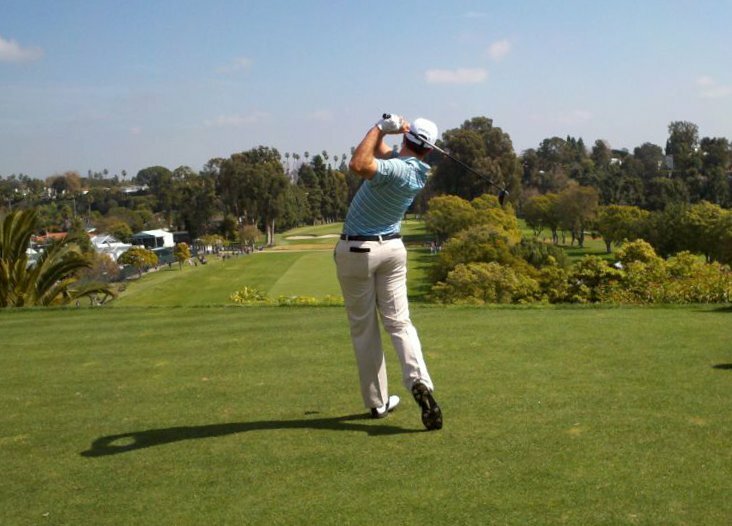 Last week, the PGA Tour played at the Riviera Country Club in Pacific Palisades. This week the tour moves south of the border to the Mexican Riviera. 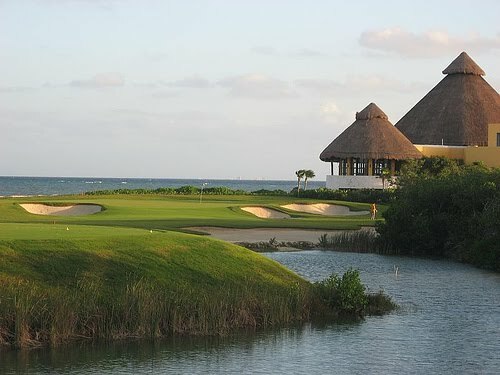 The Mayakoba Classic will be held at El Camaleon in Riviera Maya, Mexico. The Mayakoba is being held the same week as the Accenture Match Play Championship being held in Michael Thompson's home town of Tucson, Arizona. While the top 64 golfers in the Official World Golf Ranking (OWGR) list are playing the Accenture, the rest of the PGA Tour will be playing the Mayakoba. Speaking of OWGR, Michael has moved up to number 104 on that list. Maybe next year we'll be seeing him play in Tucson instead of Mexico! Michael will be looking to build on the momentum he built at the Northern Trust Open last week and has even garnered some national attention as he was listed as the #9 player in the PGATour.com's Power Rankings for the Mayakoba Classic. Michael tees off early on Thursday. His first round gets underway at 6:40am local time and just for reference Maya Riviera is one hour earlier than Eastern Time. For the first two rounds Michael is paired with Vaughn Taylor and Nick Price. There is no Shottracker at the Mayakoba Classic this week so those of us who use it extensively will be feeling some withdrawals. If you were looking, you could see it coming. For three rounds at the Northern Trust Open, Michael Thompson had been a shot here or there of posting a low score and threatening the leaderboard. In each of the first three rounds he had long stretches of bogey free golf and was giving himself scoring opportunities. On Sunday, he put it all together and posted the third best round of the day: a three under par 68. The remarkable round was good enough to vault him up the leaderboard 32 spots into a tie for 17th at one under par. He was one of only 23 golfers under par for the week and ended up only six shots off the winning score of seven under par. It was his second top 20 finish of the year on the PGA Tour but, before the week began, a top 20 finish would have looked a bit improbable. He had never played Riviera before. Due to the weather, he was only able to play 27 practice holes before the first tournament round got underway. The course is notoriously difficult: small greens that are difficult to read, narrow fairways, and challenging, windy conditions early in the week. And if all of that wasn't daunting enough, the field was the strongest of the year as a lot of top ranked golfers from around the world used the Northern Trust Open as their first PGA event of the year. But from the very first round, Michael did more than just hold his own. He played each of the first two rounds at one over par. He bettered that on Saturday when he played even par and bested that with his three under par round on Sunday. Beyond the stats though, each of his four rounds showed that Michael was becoming more familiar and maybe a bit more comfortable with the course. Based on his current form, look for Michael to continue his solid play next week at the Mayakoba Classic in Mexico. This is an event he's played multiple times and enjoys. All you fantasy golf geeks have been warned! Michael Thompson put in another solid round of golf today at the Northern Trust Open. The course has been a difficult one to score on, and that proved to be the case again in the third round. His play has been really solid over the last three days, giving himself multiple birdie opportunities. The shot of the day, and perhaps the tournament, came on hole 12 when he drained a 50'-10" putt for birdie. It was the longest putt on that hole all tournament, and I could only find one other hole that had a longer putt made on it. Playing alongside another University of Alabama golfer, Bud Cauley for the first time in a PGA event, the Alabama twosome both ended the day at even par, staying at +2 overall. They'll be playing in the same group again tomorrow and will be joined by Fredrik Jacobson. All three of them will start the day at T-49. Their tee time is 9:01 PST. The Northern Trust Open will be carried on both the Golf Channel and CBS. All times are ET. Michael Thompson's tee shot from hole #10 during the second round of the Northern Trust Open. For the second day in a row, Michael Thompson's final nine holes of the day were a thing of beauty. Just as he did in round one, Michael finished his final nine holes at two under par without a bogey on a course that has gotten the better of many of the world's best golfers. He finished round one at one over par for the day and two over par for the tournament which is inside the cut line by one shot. There are currently only 26 golfers under par for the tournament. Since we followed Michael's group all day, we can report that Michael's shot of the day came on the par 3 6th hole shown above. Michael's tee shot ran up the slope behind the green, reversed directions as gravity took over, and ran back down to the hole leaving him with a 6 ft birdie putt, which he made. Jeff Overton who was playing in Michael's group then did a similar maneuver, deciding to go for the bank shot instead of trying to make a 48 foot putt from the front of the green. His shot rolled to within a foot of the hole which he made for a tap-in par. We were happy to see Overton birdie the last hole of the day to make the cut on the number. Ryuji Imada had a rather colorful scorecard today, making 5 birdies, yet finishing at 7 over par. He was having trouble with chips landing short and missing putts. He earned a good round of applause at the end though when he chipped in from 12 yards. Unfortunately, it was too little, too late. "Hope I get to play with fellow Crimson Tider Bud Cauley tomorrow." The Riviera Country Club is a difficult course in ideal conditions but when the wind picks up like it did today, it can be down right diabolical. Despite the conditions, Michael Thompson managed to shoot a one over par 72 which is currently good for a tie for 37th. The wind caused play to slow down so much that not all golfers were able to finish their first rounds before play was suspended for darkness. Currently there are only 24 golfers under par. Michael's round was highlighted by a phenomenal back nine where he was two under par and did not record a bogey. At the time, most players' scorecards where getting cluttered with crooked numbers. Michael's shot of the day came at the par three 16th hole where his 166 yard tee shot landed a mere foot and half from the hole to record a nice tap in birdie. Michael's second round is officially scheduled to start at 1:04pm PST from the tenth tee. That may change slightly due to the delay caused by players still finishing their first rounds. Once again, he will playing with Ryujii Imada and Jeff Overton. The Thompson Tide will be in the gallery tomorrow cheering Michael on. We'll try to provide some Twitter updates from the course so make sure to follow the Twitter feed on the side of this page. Michael Thompson returns to action Thursday after a week off at home. He'll be a playing in a new tournament for him, the Northern Trust Open at the Riviera Country Club. Located in Pacific Palisades, an upscale neighborhood located between Brentwood and Malibu in Los Angeles, the tournament will be sure to feature great weather and lots of sunshine. We here at the ThompsonTide are excited, as we plan on driving up Friday morning to watch the second round in person. 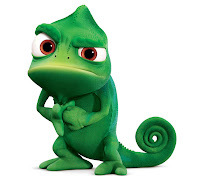 Make sure to follow us on twitter as we may have some updates throughout the day. Michael's first round gets started at 8:19 am PST and he will playing with Ryujii Imada and Jeff Overton. Michael's 2nd round at the Waste Management Phoenix Open did not go so well. Like a phoenix, his three birds were consumed by six bogeys. 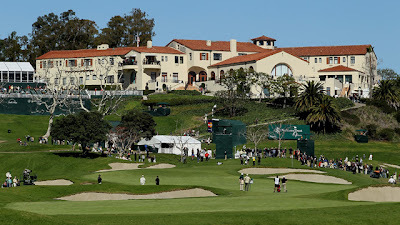 Now it's time for a one week break before returning to rise up again in the City of Angels at the the Northern Trust Open at the Riviera Country Club. See you again in two weeks folks. Michael Thompson finished his first round at the Waste Management Phoenix Open this morning at one under par in a tie for 51st. As a result of another frost delay this morning, the second round actually started before all of the groups still on the course finished round one. Michael will once again be paired with Jason Dufner and Matthew Goggin. The group has taken a short break and is back on the course for round two. Early morning frost delayed the start of round one at the Waste Management Phoenix Open and, as a result, a large number of afternoon rounds weren't able to be completed before darkness set in over the Scottsdale area. Michael Thompson was midway through his fourteenth hole when the horn sounded. At 7:30am Arizona time on Friday morning, Michael will face a 28 foot for birdie on the par four fourteenth hole. He is currently one under par and tied for 50th. First round leader Ryan Palmer finished the first round at seven under par. The early morning re-start means that Michael's first professional encounter with par three sixteenth hole known as "The Coliseum" will certainly be more subdued than it would have been yesterday afternoon although I'm sure the Mimosas and Bloody Mary's will be plentiful. After his first round is complete, Michael will have a short break before his second round gets underway. Round two is scheduled to begin on time which means Michael's second round would start at 8:42am local time although additional frost delays are possible. 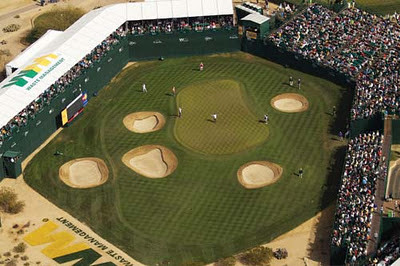 Aerial view of the Stadium Hole #16 at TPC Scottsdale. This is where the party happens at the Waste Management Phoenix Open. As a kid growing up in Tucson, Arizona Michael Thompson always dreamed of playing on the PGA Tour in Arizona. Tomorrow, Michael gets his chance when the Waste Management Phoenix Open gets underway at TPC Scottsdale. Talk about an exciting way to realize your dream. 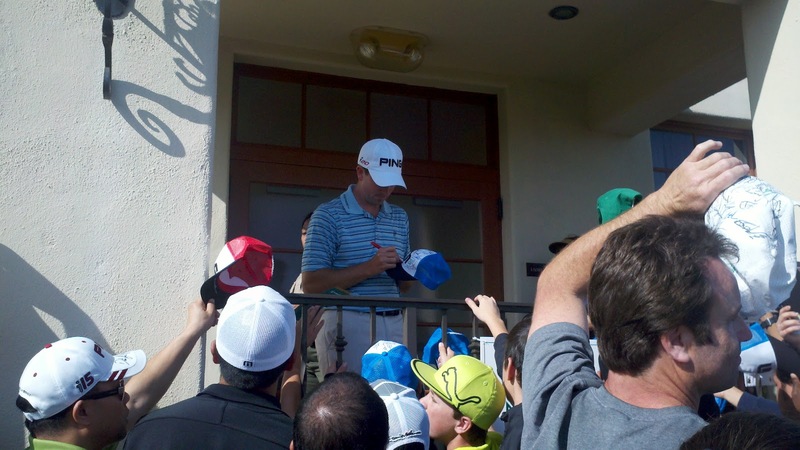 The WMPO consistently boasts the largest crowds for ANY golf event - more than 100,000 people a day. It's also known for the "The Coliseum"; the par 3 fully enclosed 16th hole that has stadium seating for more than 30,000 people. It's the biggest party on the PGA Tour; alcohol is plentiful and the crowd is raucous. To get an idea of what "The Colesium" is all about, check out the video at the bottom of this post. After the Farmers Insurance Open, Michael flew out to Tucson to get some practice time with his swing coach Susie Meyers. He will have some extra support this week as he will have local family, friends, and fans from his home state of Arizona following him. Michael will be paired with Jason Dufner and Matthew Goggin for the first two rounds. The group gets their first round underway at 12:52pm Arizona time from the first hole. By the time they reach "The Coliseum", the crowd should be well lubricated. The first two rounds will be aired on the Golf Channel from 4pm - 7pm ET.